Now, we have made great strides over the last two years in using technology and getting rid of waste. Veterans can now download their electronic medical records with a click of the mouse. We're selling acres of federal office space that hasn't been used in years, and we will cut through red tape to get rid of more. But we need to think bigger. In the coming months, my administration will develop a proposal to merge, consolidate, and reorganize the federal government in a way that best serves the goal of a more competitive America. I will submit that proposal to Congress for a vote – and we will push to get it passed. this is a wonderful speech. i'm a student and i'm moved by this speech greatly. Good job Mr Obama... Thats what the country need now....The president is also getting himself ready for 2012. 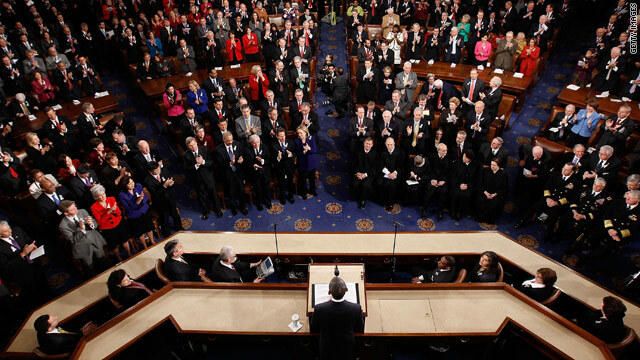 US President Barack Obama uses his the 2011 State of the Union address to call for parties in the divided US Congress to work together. Good speech! I enjoyed the pep talk but also the truths about how America is too busy fighting itself and not focusing on the future.I like again the part about not taking education for granted and parents "turning off their tvs". Very well stated speech. This president is the most prolific. I hope the message is put to use in Washington and the rest of the country. Had President Obama taken responsiblity for the build of divide between the parties, I MIGHT have listened closer. PLEASE don't call for civilized rhetoric, when you (being the President & leader) have called your "opponents" enemies over and over, hostage takers over and over, and ordered us "to the back". I must know...what the hell does that even mean? Campaign mode and realization he has lost one major part of the US in the last election. Remeber, when he calls them enemies, hostage takers, etc....that's what he's calling MANY Americans. I adhere to all Americans........please don't get sucked in.......we're in campaign mode now. Just think... he drove us deeper when he had alot to lose in 2012. If he gets in again, he has nothing to lose. Scarey! I listened to the entire speech, but entered this site to make a copy. Why have you used an old picture? The picture you used shows the President in front of Joe Biden and Nancy Pelosi, and he doesn't have on the blue tie he wore tonight. Thank=You, and God Bless You, Sir, My President, Americas, President, with the help of God,all of Americans, working together as a country of one we shall suceed and climb our highest mountain yet!! Not a single word about the plague of illegal immigration.